To say we didn’t give you any warning would be a lie – at this point, you’ve had ample time to come up with a costume and we’ve done our fair share of reminding you. But being that today is October 31 and your procrastinating ways have caught up with you, it’s time for a last-ditch disguise. Luckily, the Internet giveth (and taketh away … but in this case, it just giveth). All you need for these costumes is an Internet connection, some string or ribbon, a printer, scissors, and a guilt-free conscience (because for some of these, you’re about to waste a lot of paper). No more excuses, friend. These kid-friendly masks from Mr. Printables only cover up the top half of your face, suggesting that the rest can be used to inhale a steady stream of Dots and Snickers. In 2007, Forbes made its own masks for the year’s “most frightening people.” So, sure, you’re a little outdated, but beggars can’t be choosers. Also, any homage to Dennis Kucinich is timeless. Star Wars has made some fairly intricate masks of Darth Vader, Yoda, an ewok (which I’m going to go out on a limb and say is Wicket because he’s my favorite), Leia, Admiral Akbar, and many more characters available for download. You can bank on these being recognizable. If you’re an Orphan Black fan, then this compilation of character masks from the show’s official Tumblr just made your day. Canon has a slew of printable masks in its online Paper Crafts catalog, but the real stunners are the bear and moose disguises. Honorable mention goes to the red panda mask, because red pandas are adorable. This Women’s Day post also features some great animal mask downloads. Might I recommend the panda? Naturally, Etsy has a Grumpy Cat mask you can download. The creator also has a variety of other masks available, but you probably already stopped reading. If you want to look truly insane, this Princess Katherine print-out is sure to do the trick. What if you’re going with a group, or want to throw together a last minute couples costume? Well first of all, this is a seriously procrastinated effort, and second of all, Etsy again has you covered. One creator has a bevy of Disney couple and group masks for you to choose from. It’s worth mentioning the same designer offers Hello Kitty masks. The man, the myth, the legend. Parks n’ Recreation fans’ favorite wood-carving, meat-devouring, libertarian manager has his own mask, thanks to Tauntr. And now, it can be yours. If you forgot to get your kid a costume (shame on you!) or are a diminutive person (no shame – I wore a child’s Boba Fett costume for three years in a row … including last year), then Cutout Costumes has you covered. You can print out these get-ups in full and decorate yourself in paper. 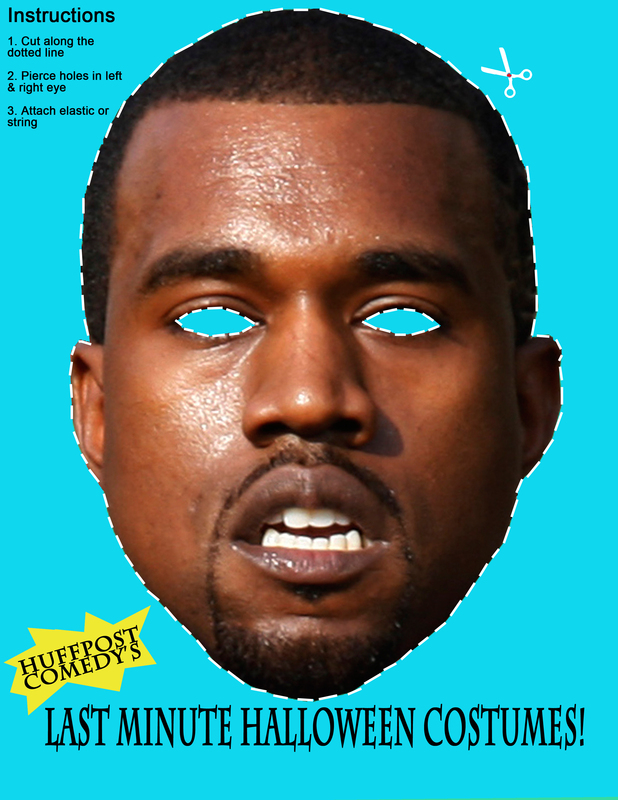 Huffington Post has given the world this Kanye print-out mask, and we cannot thank them enough for it. Well done. Vulture found a designer’s orgami-mask homage to The Dark Knight Rises, which you can reappropriate – the best and most preservable option being Bane. Yeah, the movie came out last year, but Bane’s a bad guy (arguably – I don’t want to have that fight here … let’s move that to Reddit) and that’s always popular Halloween fodder. Buzzfeed has graced the Internet with these Orange is the New Black character masks, and they are eerily accurate. Cheezburger has you covered if you want to go creepy – a la this Weeping Angel mask. The Indianoplis Colts quarterback’s face can be yours, for the low, low price of printing this mask and somehow fixing it to your face. That is a piercing gaze you have there, sir.